Shown at the South Pole in summer, Thomas Gaisser, Martin A. Pomerantz Chair of Physics and Astronomy, is leading UD’s effort to build the “IceTop,” a surface array of detectors for the world’s largest neutrino telescope. Editor’s note: This is one in a series of articles featuring UD polar scientists that will appear on UDaily during the International Polar Year. For a gateway to past and future articles, be sure to visit UD’s polar research Web page at [www.udel.edu/research/polar]. 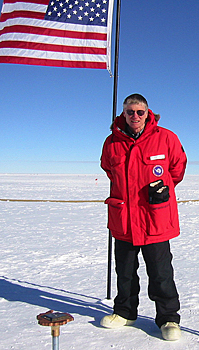 3:18 p.m., May 23, 2007--The University of Delaware is helping to build a huge “IceCube” at the South Pole, and it has nothing to do with cooling beverages. “IceCube” is a gigantic scientific instrument--a telescope for detecting illusive particles called neutrinos that can travel millions of miles through space, passing right through planets. A poet might refer to them as stardust or ghosts from outer space. But to astrophysicists, neutrinos are the high-energy messengers from the universe, formed during such cataclysmic cosmic events as exploding stars and colliding galaxies. When the novel telescope is completed in the next several years, a cubic kilometer of ice at the “bottom of the world” will provide a new eye into the heavens and some of the most distant and violent events in the cosmos. The telescope, its third year of construction recently concluded, is an international effort involving more than 20 institutions. The project is funded primarily by the National Science Foundation, with additional contributions from Belgium, Germany, Japan and Sweden, as well as the U.S. Department of Energy and the Wisconsin Alumni Research Foundation. The lead institution for the IceCube project is the University of Wisconsin, which is working in collaboration with UD and several other universities across the nation. The telescope’s optical detectors are deployed in mile-and-a-half deep holes in the Antarctic ice. Thomas Gaisser, Martin A. Pomerantz Chair of Physics and Astronomy, is leading the UD project, which involves 16 scientists and technicians throughout in the physics and astronomy department and its affiliated research center, the Bartol Research Institute. The primary function of the institute is to carry out forefront scientific research, with a primary focus in physics, astronomy and space sciences. When completed in the next several years, the telescope will consist of more than 70 strings, each containing 60 optical detectors, frozen over a mile-and-a-half deep in the Antarctic ice cap. Working in the harsh polar environment is no easy feat. On average, it takes a specially designed, 5-million-watt hot-water drill 48 hours--two full days--and 4,800 gallons of jet fuel to melt one of the holes for deploying a string of the telescope's sophisticated sensors. And approximately 200,000 gallons of melted ice is generated in the process. Once a hole has been drilled, a deployment team begins lowering a string of 60 optical detectors into it. 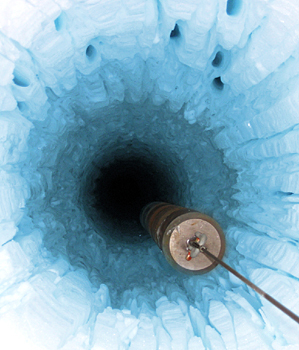 It takes 11 hours to deploy a single string and several days for the water in the hole to freeze again. Then atop each of the deep ice strings, UD scientists and technicians are installing two 650-gallon tanks of water that each contain two optical detectors. The tanks are filled with water, and the freeze is controlled to produce perfectly clear ice, with no bubbles or cracks. How does the IceCube telescope work? Click here to launch the animation, courtesy of the University of Wisconsin-Madison. Each optical detector suspended in the ice is a computer and data acquisition system that has at its heart a photo multiplier tube, a device sensitive enough to detect a single photon of light. 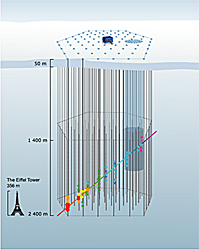 As a neutrino passes through the ice, it occasionally slams into a molecule of ice. This collision generates other particles, called muons, that produce a small flash of light as they pass through the ice. The optical detectors capture the flash of light and stamp it with a precise time code. This information is then relayed to the surface to the IceCube Lab, where the path of the particle can be reconstructed and scientists can trace where it came from, perhaps an exploding star or a black hole. 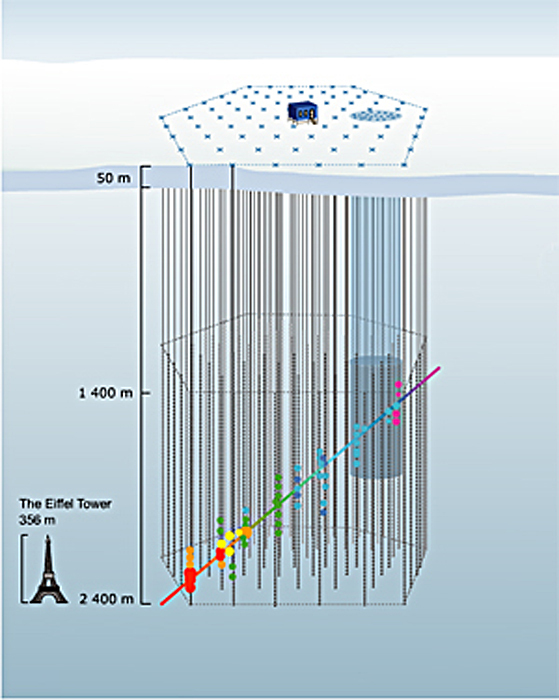 “We are now analyzing data obtained during 2006 with the 32 IceTop tanks and nine IceCube strings--a total of 604 digital optical modules,” Gaisser said. “We added 13 more strings and 20 more tanks to IceCube in the season that just ended, and the detector will be completed over the next three or four seasons. Meanwhile, we expect to publish the first scientific results of IceCube this year and next, and we hope for new discoveries even before the detector is complete."